Keeping your pets safe in the home or yard is a year-round job. Similar to child-proofing a home before a baby starts crawling, it's very important to ensure that all safety hazards around the home are addressed before allowing your furry friend to roam free. Pets love to chew and eat anything that looks interesting. Dogs are surprisingly adept at opening cupboard doors and drawers. Once your pet gains access to these areas, he could consume a variety of food, medications, or cleaning supplies that are poisonous to him. Keep dangerous items in areas that your pet cannot reach, even if means adapting child-proof locks on your cabinets. A dog has a "superhuman" sense of smell and uses it to see their world. Many dogs show an avid interest in kitchen garbage, and who could blame them? It's full of enticing food scraps along with plenty of bacteria and toxin-producing molds from spoiled foods. Wastepaper baskets in your bathroom can also draw attention to your curious canine and often contain hazards like razor blades, dental floss, and expired medications. Many indoor and outdoor plants can make your dog very sick. Check the ASPCA website (aspca.org) to find out which plants can be toxic. Remove dangerous food that will make your dog ill from low counters or tables. Many types of "people food" can be deadly to your pet. Onions, grapes, and chocolate are just a few poisonous foods that can potentially harm your dog. Look around your home for items that could be a choking hazard. Anything small enough for your pup to chew up and swallow like shoelaces, socks, children's toys and sewing supplies. One of the best things you can do for your pet is to give him time outdoors. But before he heads out to play in your fenced yard, however, you should make sure that it, too, is a safe place for your four-legged companion. Make sure your fence structure is secure by checking for loose areas around it that your dog could sneak through, or get hurt by jagged edges. It is very important to keep an eye on your pet when he spends time outdoors. Certain breeds are known for digging under or climbing over fences. No matter what type of fence you use, make sure that your pet always has some form of identification in case he does get out of the yard. 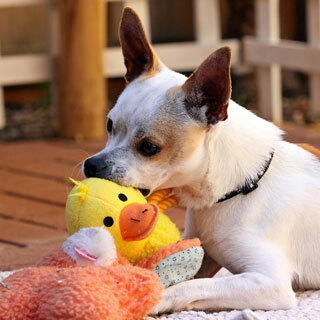 Look around the yard for anything that might entice your furry pal. If your dog is a "chewer," be sure to keep your garden hose out of the way. Check for harmful plants. Depending on the season, keep your dog warm or cool enough when outside. If your dog has access to the garage, make sure any dangerous equipment is put away safely. Don't let your pet come in contact with hazardous chemicals such as insecticides or antifreeze. Keep these kinds of materials locked up in storage areas. You've carefully removed any dangerous items and your home and yard are doggie-proofed. But now your canine friend has decided to chew the sofa cushion or the wooden chair leg instead of getting into the garbage. Boredom and separation anxiety can lead to destructive behavior. This is especially true when you're gone and your pooch is home alone. By taking a holistic approach to dog- and puppy-proofing your home, you not only remove dangerous items from his environment, but also satisfy his natural urges for play, exercise, and socialization. Make sure your dog gets enough exercise before and after you return home. Leave his favorite toys and chew sticks in different areas of the house. These will be surprise finds for your dog when he decides to start exploring and looking for things to destroy. While you're away, leave the television or radio on to re-create household noise. Limit access to certain rooms when you're gone. Close the door to your office, bedroom, and bathroom. Keep your pup in the kitchen if you have to by using a baby gate or crate that is large enough for your dog to stand up in. Consider installing a secure outdoor dog run that includes comfortable shelters. Dogs are social pack animals and because of that, they can feel isolated, stressed, and lonely if left for long periods of time. Have a friend or dog-walker stop by, come home at lunch, or enroll your furry friend in doggie day care. This way you can feel a little more secure, knowing that your dog is in a safe setting while you're away. Dogs love to greet you, no matter if you've been gone for one hour or five. Playing with your dog is great stress relief for you and your pet, whether you are throwing a ball, pulling on a toy, teaching him to jump into your arms or simply playing chase.